Inconvenient Ice Study: Less ice in the Arctic Ocean 6000-7000 years ago | Watts Up With That? Since there is so much worry about the Arctic Sea Ice extent this time of year, it is always good to get some historical perspective. According to this study, our current low Arctic ice extents are not unprecedented. ”The beach ridges which we have had dated to about 6000-7000 years ago were shaped by wave activity,” says Astrid Lyså. They are located at the mouth of Independence Fjord in North Greenland, on an open, flat plain facing directly onto the Arctic Ocean. Today, drift ice forms a continuous cover from the land here. Astrid Lyså says that such old beach formations require that the sea all the way to the North Pole was periodically ice free for a long time. “Changes that took place 6000-7000 years ago were controlled by other climatic forces than those which seem to dominate today,” Astrid Lyså believes. Take advantage of latest 350-001 dumps and 640-802 practice exam to practice and pass your VCP-410 exam on first try. September 8, 2010 in Arctic, Paleoclimatology, Sea ice. Isn’t this old news? Have there been any follow-ups since this research or other studies done? Does a warm August lead to a warm fall when we look at the temperatures? Checking at the top 5 warmest Augusts in Cleveland, the results are fairly consistant. This article provides more evidence that what is being observed in the Arctic is regional climate variability. It has happened in the past, and it will happen again. Human activity has nothing measurable to do with any of it. I posted the link above for the Geological Survey of Norway on Romm’s Climate Progress as well as Historic Variation in Arctic Ice and was quickly censored. It appeared fleetingly then was deleted. The proof of censorship can be found here. Citation: Ledu, D., A. Rochon, A. de Vernal, F. Barletta, and G. St-Onge (2010), Holocene sea ice history and climate variability along the main axis of the Northwest Passage, Canadian Arctic, Paleoceanography, 25, PA2213, doi:10.1029/2009PA001817. Weasel word aside, what evidence is there to support such a belief? Now why would she feel the need to go and say a completely unscientific thing like that, based on a mere belief? Can’t imagine. 6000-7000 years ago, north of Greenland, there was more open water than there is today. The Arctic Ocean may have been completely ice free as the weather was more temperate than today. Yeah I caught that, too. Gotta put in the obligatory circular reasoning AGW plug for funding, even if it is only a cryptic implication like this one. Interesting, indeed. And it’s never inconvenient to learn something new. However, this particular article isn’t really new. I read something similar a couple of months ago. The seasonally ice-free Arctic ocean was probably a consequence of increased solar irradiance during the summer months due to a shift in the Milankovic cycles. And I would be very surprised if researchers of the NGU were ‘sceptical’ of the AGW, at least there’s no hint of that in the story. 6000-7000 thousand years it’s a very long time, did the GWRs were already preaching around Global Warming?. Can’t believe it….the great,great, great,great grandfather of Al Baby ! This indicates that the Arctic sea ice is quite fragile and it doesn’t take a large increase in temperatures for it to melt completely during summer – temperatures not much higher than where we’ve been in recent years. In other words, the ice does indeed respond strongly to external forcing, as we’re seeing now. You know what tundra is? Frozen peat. You know what peat is? Dead trees and bushes. Since the peat goes right up to the Arctic Ocean, trees must have grown there in the past. Trees don’t fare well in ice year round. And the oil under the tundra? Guess. If you research the history of the polar bear, a species that is only about 250,000 years old, you realize they were brown bears who wandered north when the forest grew near the Arctic ocean, searching for food. They turned white to hunt seals. It’s called Evolution. Welcome to the Early Holocene Thermal Maximum! Summer insolation was substantially higher in the Arctic in the early Holocene because of changes in the Earth’s orbit (Milankovitch cycles and all that). I can just imagine how shocked people might have been if our modern technical society had developed during the fading years of the last ice-age. Just picture the ‘save the ice’ campaigns to stop anthropogenic global melting. An object with specific weight higher than that of ice will slowly sink further down. Wait, mammoths had gone also. If only this kind of data would sink in with the alarmists. We could see a press release like. Anthony, I have been looking for a peer-reviewed paper on this study ever since that press release was issued. No sign of it yet. If they haven’t been able to get it published, we should be asking ourselves, why not? If we can’t see the details of the study, everything said in this PR piece should be taken with a grain of salt. I have come across no other evidence that the Arctic was ice-free in this region during the Holocene, particularly “all the way to the North Pole” [why do they say this? based on what evidence?]. This area is historically where the very thickest and most stable ice is found. Even if their interpretation of the ridges is correct, could these ridges not have formed during intense September storms over a week or two when winds briefly drove ice away from shore? There was a period about that time (ca. 7000-8000 years ago) when the ice dam holding back the last of the Laurentide Ice Sheet meltwater (around Hudson Bay) broke through. I’m sure sea ice conditions shifted briefly around that time, but surely that would not have constituted “normal” arctic conditions by anyone’s stretch of the imagination. More data to falsify ‘the Earth is warming, we’re all going to die!’, mantra from the likes of Hansen et al. Perhaps they live in an alternative universe which operates on different laws of physics? This is a good illustration of how by picking a suitable base period as ‘normal’, it is easy to show a false warming or cooling trend. In the mean time, weather/climate continues to oscillate up and down, just as it always has. Mankind needs to be prepared for whatever threat this brings. This is the same era when the Sahara became wet and hospitable. So what happened? Was everywhere warm, or did all the worldwide weather bands all just move north a bit – so the ITCZ ended up over the Sahara, and N European weather ended up over Greenland? Climate progress is posting a complaint regarding censorship at Digg.com Now any reference to this finding will and must be censored by climate progress. You will have to check, but it is possible that an aluminium structure will gravitate through the ice until it hits bedrock. A penny on an ice-cube will perform a similar trick. And 125000 years ago a sea passage once divided Antarctica. The Guardian sees this as a global warming warning sign but misses the obvious, that the previous interglacial was NATURALLY much warmer than this one. See also Drenge et al, The Nordic Seas” An overview. Does anyone know whether the current ‘retreat‘ of Arctic ice has anything to do with a a natural climate variation “Bond Event”? Here are lots more references relating to past climate variation in the Arctic, (click here). 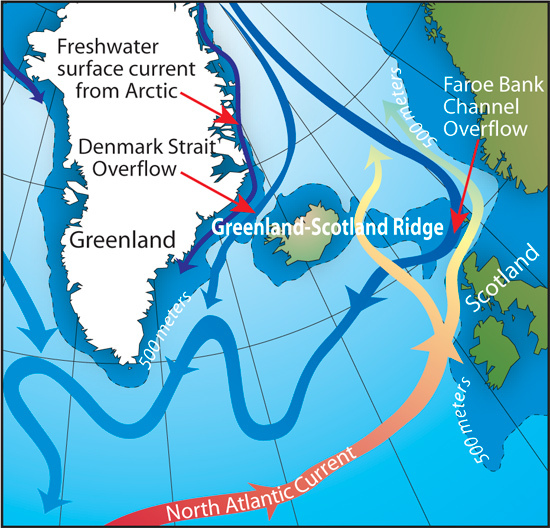 As warm waters inflow increases, keeping Arctic’s temperature up, so it does outflow of the cold currents. This shifts ‘jet stream’ further to the south in the NW Atlantic as it was the case in the recent months. I would suspect similar but more extreme could have been the case around 4000 BC, when present deserts of the North Africa and the Middle East were fertile lands of the ancient civilisations. However, at the same time N. America could have been much colder than today. ‘“Changes that took place 6000-7000 years ago were controlled by other climatic forces than those which seem to dominate today,” . I would like to make a more charitable suggestion, that they said this to avoid the aggression characterised by so many warmists in the academic and political establishments when their cage is rattled by plausible contra-indications of unprecedented warming. These Norwegian researchers want to keep their jobs. Interesting news. One of the striking features of climatism is the timeframe which is used to determine “normal” climate, or climate change (i.e. deviation from “normal”). Considering the age of our planet, the whole time for which any temperature readings are availalble is nothing more than the blinking of an eye. I would not at all be surprised if some research into the myths and sagas of the various tribes living in the arctic (Inuit, others) would reveal hints to less and also to more ice than we see today. Who knows, maybe they even got there on open water in the first place. Why should the sea conquering people which inhabitated the pacific islands not have ventured north as well? Just a very wild speculation. The record ends in 1905. Here it is merged with instrumental Greenland record and the alleged anthropogenic warming is depicted in green. HS and “unprecedented climate change” demolished in one pass. Which external forcing, except the Atlantic SST changing in cycles, Dr Meier? You know what tundra is? Frozen peat. You know what peat is? Dead trees and bushes. Well, not really… tundra is generally an area on top of permafrost. Peat is almost always dead sphagnum moss. Not convinced that your quote regarding the planes is evidence of anything other than that someone is deeply confused, and thinks that precipitation should be uniform over Greenland. Informative, interesting, on topic for here and refreshingly clear of hair-shirtism! It might be because it’s been termed a ‘Long Term Project‘. The story above was reported in 2008. Here are some of the same authors in 2006 – Original IPY project no: 777. Sure did, I saw it. Look at any of the Arctic sea ice threads. the ice is the thickest and most stable because winds blow it there. So, think about that. If there was any ice in the Arctic, this is where it would be. Nothing inconvenient or controversial about the effects of the Holocene Climate Optimum, which exactly the period in question. It is well known that temperatures in the Arctic areas during this period were warm enough to cause a retreat of the sea ice and so one would expect to find evidence of this in the record of wave action on beaches. Furthermore, nothing in this study negates or refutes the notion that current warmth could be related to the 40% increase in CO2 since the 1700’s. I do find the sudden posting of this study from two years ago to be a curious event however, as no new study or research on this seems to have precipitated this posting. That penny trick requires a warm, not frozen penny, and an ice cube that’s nearly melting. The airplanes were below freezing temperature long before they got buried in snow. And an airplane full of air is several 1000 times less dense than a solid copper penny. Here’s a link to part of the story of the recovery and rebuilding of “Glacier Girl” one of the P-38s that is now flying for airshows. Of interest is that the tail of the airplane was 8 meters behind the rest of the fuselage due to uneven ice flow. http://p38assn.org/glacier-girl-recovery.htm The airplane recovery team learned a lot about the dynamics of glacier flow to the sea, where they routinely break off and create icebergs. This is not terribly surprising. There is much evidence that the Arctic was warmer in the mid-holocene than today. I would think that that temeratures were a lot higher during the holocene maximum and as co2 does not cause the earth to warm that much. I doubt if we will ever see the earth warm to the same temerature as the holocene maximum this side of the next glaciation. Sorry Tarpon, but this is not the case. Tundra is first and foremost permafrost, no proper trees will grown in a permafrost soil, the growing season will be too short. It’s therefore perfectly possible for tundra peat to contain no tree remnants at all. Don’t know if anyone saw this as I just found the news….. Fig. 12. Comparison of a multi-proxy reconstruction of sea-ice extent in the Nordic Seas during 1200–1997 AD (black curve; Macias-Fauria et al., 2009) and maximum Arctic-wide ice extent during 1870–2003 (red curve; Kinnard et al., 2008). The discrepancy between the two records in the early 20th century corresponds to an increase in the Atlantic inflow to the Nordic Seas (e.g., Polyakov et al., 2009). I have made my point on the climateprogress blog too. In 1956, Jean Malaurie’s ‘Last Kings of Thule’ was published, relating his ethnographic observations made during a year in northern Greenland. There is nothing whatever about climatology in the book, except this: He was there to study raised beaches. You cannot study raised beaches unless they are, you know, raised. So there must have been less ice earlier. Ha, Ha!, that’s not the correct answer as you can have very small particles with a very high specific gravity floating on the ice, as a needle floating on a glass of water. It’s size! In anyway those ice core analysis are as good as palm reading, phrenology or tea leaves readings, also like Mann’s dendrology. Then we are in a “Holocene Pessimum” as you may well check very soon before Christmas. Furthermore, nothing in this study negates or refutes the notion that current warmth could be related to the 40% increase in CO2 since the 1700′s. Whilst there may be debate as to the causing of the warmer conditions 6,000/7,000 years ago, the one thing that there can be no debate upon is that those warmer conditions did not wipe out any major artic living species (eg., it did not kill off the polar bears). Further, there is no evidence that those warmer conditions were bad for man. Indeed, this is when civilisations began to flourish (viz, the beginning of the Egyptian empire). That being the case, where is the problem if the world warms say 2degC? Species simply adapt (man included). Now that polar bears don’t seem so endanged, the warmist science studies speculators (and grant providers) are trying to rope in the narwhals as their pet of the month. “The climate and renewable energy con is losing its luster – prompting anguish and desperation” Icecap Note: To see how desparate they have become – they are lying through their teeth as this SPPI story by Tom Nelson shows. This is what happens when prophecies fail. It’s been a rough few weeks for the “eco-progressive” fringe. No it hasn’t. Just a wet start to the Autumn (nothing unusual there) with some wind in a few places (nothing unusual there). Very odd to cite England. Needle or coin floating on the water, surface tension, different physics principle here regardless of their study. Metal objects are highly conductive. Solar storms pump large electric currents into any metal object in the Arctic area, remember Canadian greed burn-out. This aircraft if it exist would be frequently heated by induced currents from magnetic storms, sinking ever deeper. BTW Magnetic storms penetrate the arctic lithosphere to depth of hundreds of km (ask Dr. S.). There you are: That’s it, precisely!. Small particles are proportionally less subjected to gravity than to EM fields. It’s like politicians know, a matter of “spin”. It is usually found in chemistry that, for example, we can produce a copper carbonate of a low bulk density, where particles are electrically charge and repel among them, and another of high bulk density where that charge is presumably lower, apparent color also varies. However charge does not relates always inversely to diameter, there can be of a third kind: Of a high bulk density and smaller particle size. What takes us to gravity…. BTW Magnetic storms penetrate the arctic lithosphere to depth of hundreds of km (ask Dr. S.). Whilst not contemporary to the report concerning this period 6000 years ago, there is lots of evidence of warmer times in the Arctic without needing to resort to the evidence left by the Vikings. Doubtless there are other treasures waiting to be discovered. “….In other words, the ice does indeed respond strongly to external forcing, as we’re seeing now. Walt, if I may call you Walt, I think the point at issue is that the MSM and general public are under the impression it’s never happened before. As in ‘unprecedented’ and ‘polar bears facing extinction’ etc. By the way how did the polar bears survive the great melt 7000 years ago? As you wind the clock back towards the time of the Holocene optimum, summer insolation above 65N increases due to the Milankovich cycle (particularly the Earth’s obliquity, which increases as you go back in time). It would be surprising if the arctic wasn’t warmer then than it is now. Going forward in time, the obliquity is decreasing, which will lead to cooler summers – and gasp – more sea ice! When you look at the Milankovic cycles, the arctic got about 60 W/m2 more solar irradiation during early holocene summers than today. The main reason has been the fact that arctic summer solstice still was close to perihel, while today, perihel is around winter solstice, on Jan 4. Perihel has coincided with arctic summer solstice about 10000 years ago, this was the time when the great ice shields of Northern America, of Europe and Sibiria disappeared. 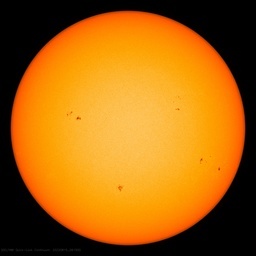 Then, there had been 80 W/m2 more solar irradiation during arctic summer than today. However, the Greenland ice shield had survived and it also did survive early holocene, as is obvious from the cores of the bore holes drilled into the Greenland ice. Leif Svalgaard has told me a while ago that he had asked Gavin Schmidt to carry out a climate model calculation for the early holocene, say, for the time after the 8.2 K event, when all relevant parameters for the earth had become rather close to present days values. No time, has been the answer, if I recall Leif’s story correctly. Actually, if a model calculation existed, which shows convincingly that on the one hand 60 W/m2 additional solar irradiation would not kill the Greenland ice shield, but 1 or 2 W/m2 more warming through CO2 greenhouse effect would do so – even the biggest sceptic would abjure his evil thoughts. Included in the results of the model calculation had to be an answer to the problem why in present days a series of positive feedbacks such as permafrost thawing and consecutive methane release should occur, while for reasons unknown to me they have not occurred in early holocene. To be more serious, there exist model calculations for the CLIMAP project, which covers the time of the maximum ice extend 20000 years ago (see wikipedia). In fact, according to wikipedia, the model results disagree severly with the geological data. Thus it was concluded that there must exist problems with the geological data. About 6000 years ago buffalo hunting on the Western Canadian plains came to a complete halt and lasted for about 1000 years. The reason a shortage of grass for the Plains Buffalo. No grass means a warm, dry climate. I’m not trying to say this is related to the Arctic ice pack but it does give some food for thought. Correlation does not prove causation, Dr. M. The presence of a forcing does not prove that it is the origin of an effect, even if it precedes the latter. Also, you don’t mention it, but is it not clear from the record that absence of summer sea ice must not involve a climate tipping point? Penguin optimum was when it was warmer, we know when it cools, they die and migrate closer to the equator. It’s not like they like living in cold. Remember that the increased early Holocene insolation was only in the high latitudes during summer. The global annual insolation changed little. I haven’t read all the comments, so, if its been said already, it bears repeating anyway. We’ve had less ice in the arctic in the last 30-70 years. I do find the sudden posting of this study from two years ago to be a curious event however, as no new study or research on this seems to have precipitated this posting. The uncertainties in paleoclimate reconstruction remain a live topic. Why did the warming from a significant increase in high latitude precession–driven solar forcing take thousands of years to work its way into lower latitudes? What is should be clear to anyone who has studied the last few hundred thousand years of Milankovitch cycles when looking at at temperatures/CO2/interglacial is that the present era is unlike anything that we’ve seen during at least the past 400,000 years and probably much longer. We are seeing Arctic temperatures now approach those seen duirng the Holocene Optimum, and I think you can well reason that if the ice melted then, as is quite possible, it will melt now, as we see happening. Walt Meier’s point about the sensitivity of the ice is exactly to this point. But even more importantly, the melting 6,000 or 7,000 years ago was caused most likely from Milankovitch cycles, whereas the most likely mechanism today is the 40% higher CO2 we have now than we had during that period of the Holocene. Morevoer, the warmth we are seeing now is far more global than the warmth during the Holocene, which is one more indication of the differences in the effects from the insolation and Milankovitch cycles versus global CO2 forcing. Plenty more open water there today James! Or it could be we don’t have a clue about what causes what. Further, I find these exercises of what causes what entirely academic. I could assert that the most natural state of H2O, throughout time, is liquid and that man’s experience and knowledge of the globe is an aberration. What is certain, is that our knowledge of a “natural” state of the globe is woefully inadequate to come to any determination. There’s plenty of evidence that shows CO2 was at a higher concentration in the past, so does it matter if man puts out CO2 or not? Intuitively, I’d say no. Especially if it is given that man cannot create matter. Mankind has shown an incredible knack for adaptation, the earth has shown a great affinity to continue to rotate and equalize whatever is occurring on its surface. I think things will be fine. Milankovitch cycles or not. Have you seen the Pole waters today? I am not Antony,but Susan, how do you know this article has not been peer-reviewed? Or do you mean you have been looking for an endorsement from the IPCC or any other high ranking AGW organization? Peer-review in scientific research articles/ papers only means that a particular article/ paper has been inspected by the writer’s peers and should therefore not contain any glaring scientific mistakes or conclusions. Peer-review is not supposed to be some kind of gate-valve keeping out scientific research findings of any kind. Those areas were covered by receding continental ice sheets. Mr. Werme: this is well known enough to have appeared on PBS “History’s Mysteries”. Further South, the Kansas-Nebraska area was actually a SAND-DUNE DESERT roughly contemporary to the Wettest Sahara period. A few of the Dunes survive as a National Monument. Jimbo, see my previous post. The point here is not about whether or not there has been periods of lower Arctic sea ice in the past– as undoubtedly the Holocene Optimum saw periods of reduced Arctic Sea ice. I don’t think anyone would dispute this who has seriously studied the period. The more interesting issue should focus on cause, and the differences between the Holocene Optimum and the effects on Arctic Sea ice and our current period. We have far more CO2 in the atmosphere now than during the Holocene Optimum, and the current Milankovitch cycles would not support the warming we are seeing though they were favorable for the N. Hemisphere warming (especially during summer) that we saw during the Holocene Optimum. Note, most studies show that the Holocene Optimum had it’s greatest effect at the northern latitudes and during the summer months and corresponds well with the astronomical causes (i.e. Milankovitch). The current period of global warming, which is similar to the Holocene Optimum, except that the current period is more global, and has no other known natural or astronomical cyclical causes and so we are left with CO2. You are very correct in your general statement, and I have stated repeatedly that some species will win and some will lose as the climate changes–no matter what the cause of that change. You are also correct that humans have shown a very strong ability to adapt to change. One point about the concentration of CO2 in the past however– yes it has been higher in the past, but not in at least the past 400,000 years. The 40% increase in CO2 that humans have caused in just a few hundred years is akin to a human CO2 “volcano” erupting on the planet, and it continues to erupt. Yes, life goes on and eventually recovers after such events, but the landscape is forever changed, and some species win and some lose. Such is the nature of our living planet. Now R. Gates all you need do is demonstrate that even Greenland is warmer today than the 1930’s. I don’t know, is it? I think that James Sexton’s comment of 8th September 4.04 pm to be smack on target. This is exactly as I see it. We do not know enough about how the climate works and what affects what and how this works. All we know is that after 4.5 billion years and a torid and at times a catastrophiic past, the world is still here as a habital place. This suggests that it is self regulating and a tipping point cannot easily be reached. Further, we do not know whether a warmer plannet would cause serios problems for mankind. Personally I doubt that it will. I consider that on the whole it will be beneficial. Since there is a real probability that we are powerless to prevent any warming, there is gross uncertainty as to its cause and whether that cause can effectively be controlled or reversed, whether warming will be a severe problem or no problem at all and given the adaptability of mankind, we should simply wait and see what happens preparing to react as necessary to any problem that truly causes mankind a significant trouble. My take on the cautionary principle is that we should not waste trillions on limiting CO2 when we do not know whether it is the devil that it is made out to be. If the planet still warms but does not cause man any significant problems, then those would be trillions wasted. If the planet still warms despite limiting CO2 and this causes a problem then we shall have to spend further trillions adapting, ie., pay twice over. The cautionary take is therefore to do nothing and just spend money adapting to the extent that adaption is truly necessary. If no adaption is required, we save trillions rather than having wasted it. When one considers the past history of the Earth, AGW appear a lot of hype about nothing. I thought the same thing. I also think it didn’t work. This sort of study is too threatening. These scholars received no further funding that I ever heard of. I actually saved this article when it first came out, along with others, especially those involving Vikings and the MWP. Such people never seem to receive funding. I think the arctic was ice free during the summers of the MWP. Or at least ice free enough to make the Northwest Passage passable by both Vikings and Chinese Junks. But I expect to see no hurry to research such things. What is most interesting about the period 6000 years ago is that the amassed driftwood was enough for the Independence 1 Culture to burn wood for a long period of time. Driftwood now is quite rare. I wonder if they burned it all up, and faced the first “energy crisis” we know of. I’m glad this article was resurrected. The history of past peoples fascinates me. I’m looking forward to reading all the comments this posting has generated, when I find time. CO2, being a molecule, must re-radiate any energy it stores beyond it’s capacity, which is not infinite. And, like someone posted on another thread, it can transport IR energy back to space just as easily as it absorbs it coming off the Earth’s surface. The back of the envelope on this one says that 1 in every 10,000 molecules in the atmosphere are the new C02 molecules. So we are limited to 1 in 10,000 new blackbodies of a ?higher? order. To say or infer that the heat energy re-radiated by a new C02 molecule is only going to find another C02 molecule (1 in 2564) is astronomically bad. The waters open and close. This is how it has always been in the arctic for all recordable history. The obsession over Arctic ice is superfluous. It doesn’t mean anything. The current period of global warming, which is similar to the Holocene Optimum, except that the current period is more global, and has no other known natural or astronomical cyclical causes and so we are left with CO2. With continued prose like that, I think you would be a fantastic summarizer for the next IPCC report. R. Gates said: …except that the current period is more global, and has no other known natural or astronomical cyclical causes and so we are left with CO2. Don’t take this personally, but it is a bit arrogant to claim that any recent rise has to be due to CO2 because there are “no other known natural or astronomical cyclical causes.” This implies that you have knowledge of all the known natural or astronomical cycles. Somehow I doubt that. You seem really hung up on the fact that CO2 levels have increased and that global temperatures have (possibly) increased, therefore they must be related somehow. This website is full of various ideas and theories for why the temperature has increased or not. Some of them are a little off the wall, but there are quite a few ideas that are just as plausible, if not more plausible, than the CO2/temperature link. Open your mind a little and actually read some of the alternate possibilities. Try this one for starters. I have a gut feeling that we’re heading for a “science bubble”…kind of a knowledge version of the housing or dot-com bubbles. There seems to be a trend that we know it all, and something is going to come along and remind us just how ignorant we really are. Post-normal science meets the real world. Our great-grandkids (for those of us who aren’t participating in the population control efforts) are going to look back and shake their heads at the ridiculous things we just “knew” were right; right up there with bleeding patients to cure fevers. We are never as smart as we think we are. The Greeks had a word for it…hubris. Yes, I agree. I find that you and I agree on most things. The one part of the statement that I quoted from you that I find to be the crux of the discussion to be, your words, “but the landscape is forever changed”. At what point in time has the landscape not “forever changed”? Does it matter that one “species” changed it versus another? I assert and maintain the earth has been and always will be in a constant state of “change”. Further, I assert and maintain that mankind is as much of part of nature as any other creature that walks or crawls on this earth. We are not an aberration of nature, but rather a precursor of perfection of Nature. We can do no more harm to Nature than to change our nature. Only to expound on what Richard stated, history is replete of examples where mankind thrives in a warmer climate. Suddenly, we are to presuppose that mankind will suffer during a warming period? Let me model this on my server…………….nope, we’re ok. In fact, we’re better than just ok, because mankind thrives better in warmer climates. I don’t believe for a second that CO2 causes any discernible warmth, but if it did, it should be welcomed. But, that’s just me wishing for more agrigable land. To say that current warming is only caused by an increase of 1 c02 molecule to replace an o2 molecule per 10,000 molecules is not plausible, nor does it even sound likely. Leif made a convincing argument when he shot down TSI as the dominant factor in solar heating. The numbers are not significant. Likewise, 100ppm C02 rise, as the dominant factor in climate change today, deserves to be shot down. It makes for great sci-fi blockbuster movies, but that’s the extent of it. The 2 asteriods coming withing 1 light second of Earth today, after being discovered only 3 day prior, is truly cause for concern. Extremely well said, on all points! I doubt it even makes the cut for good sci-fi material, Robert. I certainly wouldn’t pay to see it. But then again I could never suffer all the way through An Inconvenient Truth, either. I guess all the “skepticism” goes out the window here when a science study gives a pleasing answer. You know, “skepticism” – questioning every single statement, inference, data point, and conclusion of a study, and questioning the motives, competence, personal integrity and bathing habits of the scientists involved. Like, exactly why is the landfast ice piled up by Canada and Greenland these days ? Ocean currents ? Temperature patterns ? Wind patterns ? Were these factors different 6000 to 7000 years ago ? Maybe the thickest, landfast ice back then was on the Siberian side of the Arctic, and Greenland was open every summer like Siberia has been recently. How could you tell ? Have they studied “raised beach ridges” in Siberia, Alaska, Norway ? What about the lower ocean levels back then ? Did this affect the water entering/leaving the Bering Strait ? What about all the receding ice sheets dumping freshwater into the rivers that feed the Arctic Ocean ? Was the salinity vastly different back then ? How did this affect ocean currents into/outof the Arctic ? What about the catastrophic drainage of glacial Lakes Agassiz and Ojibway around 8400 yrs ago – did this affect the jet stream and wind patterns for thousands of years ? What about the adjustments to Earth’s lithosphere after all those ice sheets melted (the rebound of the crust) – was the topography of the Arctic Ocean seabed all different then ? Maybe the warm Atlantic Ocean water had a channel directly under the Arctic basin back then. Is Astrid Lyså, a geologist and researcher at the Geological Survey of Norway (NGU), qualified to say that the Arctic was sea ice free 7000 years ago because a few beaches in Greenland saw waves ? And why mention the Independence I Culture of Inuits who came to that area as “long ago as 4000-4500 years ago” if they are studying the period 7000 to 6000 years ago ? Some people came and went a couple thousand years after north Greenland was supposed to be ice free ? So what ? I think the WUWT pack of skeptic attack dogs rolls over, smiles, and wags its tail when a scientist gives them a biscuit. By “peer-reviewed literature” I only meant that I’d been looking for an-indepth description of the study in some scientific journal or other. It is the completeness of the description and the background details that I’m looking for. Its been 2 years since that press release from a study that apparently (from an earlier comment) started in 2006 or so. I have grown weary and wary of “science by press release.” If the results are so all-fired important, it should be out in print by now for us to read and decide for ourselves. I cannot decide anything from this press release. There have been numerous cites to paleo based information on WUWT. All should be checked for validity. It’s interesting that this post looks at 6000 to 7000 years ago. This is when the sea level stabilized and urbanic culture as we know it emerged and took hold as towns based upon ports located on the oceanic coast. Before this point, the rising sea levels prohibited this development. There is no known urbanic civilization older than 7000 years. Find one. Yes, in total agreement. But, as Dahlsveen stated, it isn’t a gatekeeper to thought. In fact, lately, in regards to the climate debate, it has been only a gatekeeper to “correct thought”. Obviously, there must be another mechanism to discern the validity of other thoughts. Until then, sadly, we are left to our own discernment. Hmm,……this isn’t as bad as I thought it may be……….Some one can give me a thought…..I can consider the thought……..take in all the arguments…..and discern for myself whether the thought is correct or not. ………………. Yeh, I’ll wait on a peer-reviewed blathering. If you can understand the writing of a study, do you really need someone else to determine for you if you should believe it or not? Is the science or math is correct or not? Please, do not acquiesce. It is incumbent upon us all to discern reality from fiction. Other opinions. Absolutely! Discernment, ….that is the providence of self. So why did you bring the subject up? Then shoot it down with pertinent scientific facts not this nonsense. I think that the world has only warmed a few tenths of a degree recently.How does that compare with the warming we saw in the htm? My opinion of this is shaped by watching Bob Carter videos on the causes of global warming though.The argument is the that the htm like the mwp was only local weather unlike the present day which is really global,I don’t buy this whatever the experts say. The present day warming is just another warm period in earths history and not “unusual” and does not require the explanation of agw caused by increased co2. The only “nonsense” part of that was your response above, not his post. R. Gates, I believe that oceanic SST swings do a pretty good job of matching land temperature swings. And this phenomenon appears to be quite global. Would that not be a possible source of cause and effect? I would dispute your confident assertion that human activities have caused a 40% rise in atmospheric CO2, we simply do not know the exact amount of extra CO2 humans have contributed over and above natural cyclic rises in atmospheric CO2. What is the natural contribution to the measured rise and what is the estimated contribution of human activities? This is where proxies can tell us little and what they do suggest is not always accurate by any means. We know that as the oceans warm they release CO2 so is the 40% you claim solely down to human activities or does that figure include all known natural contributions? We know that there are still gaping holes in our knowledge of the carbon cycle and so I think this 40% figure needs to be taken with a pinch of salt. Perhaps you can point to a definitive study that has calculated the 40% of which you speak, I would be grateful if you could supply information that backs up your claim. I would expect that every warm period, which cycle around every 1000 years, would have less arctic ice than now. There are ice less periods as well even in recent history, before satellite cover started the scares. 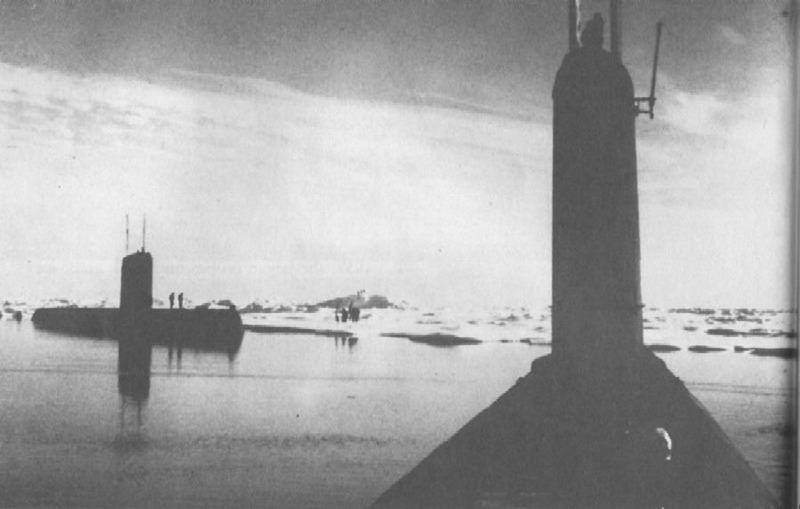 1958 produced a pole ice free as photographs of three submarines at the pole in clear water show well. (Pictures on the US Navy site somewhere). I am sure that there are other years as well. Certainly the Medieval and Roman warm periods had little summer ice in the Arctic because both were warmer than today. The reason the paper has not been published is simple – it is still in preparation. I understand from one of the authors that they intend to submit the manuscript to a high profile journal. I see no reason why it should not be published in a good journal. Less ice in the Arctic fits very well with what we know about Arctic summer temperatures in the early Holocene Thermal Maximum when there was higher summer insolation. It would be far more “inconvenient” is the ice had refused to melt despite the higher temperatures. Did anybody else notice the rounded rocks around the firepits? Could those be the result of wave action or were they tumbled in a river-like setting over many millenia? Please provide evidence that the Arctic sea ice extent minimum since 1979 was caused by warming or co2. Before you reply please read first what NASA had to say on the matter. The point about bringing up past Holocene Arctic melt extents is to cast doubt on the assumptions that its co2 man-made warming. If it happened in the past without the extra co2 then why shouldn’t it happen in the present with the extra co2? We could simpy be seeing a naturally occuring Bond Event. We could simpy be seeing a naturally occuring Bond Event. Bond events are cold events. Since the temperature anomalies are warm, it would appear unlikely that we are experiencing a Bond event. Quite worrying for the NH as cold kills. Sorry Anu, I have been thriving on these biscuits for fifty years. The ones you are selling have no nutritional value. Without a sense of history, any perspective on climate is clueless. From my rockhounding experience, I would have to flip the rocks over to see if they were rounded in situ. lacking that ability, I would generally suspect them to have been rounded in flowing water, tidal or river would do. However, I have rocks, amorphous quartz, with a natural high polish on one side, found in the high plains, polished by windblown sand, presumably over centuries. They didn’t tumble as the side in the ground is unpolished. Anthony, I have been looking for a peer-reviewed paper on this study ever since that press release was issued. No sign of it yet. If they haven’t been able to get it published, we should be asking ourselves, why not?…. I have come across no other evidence that the Arctic was ice-free in this region during the Holocene…. Don’t take this personally, but it is a bit arrogant to claim that any recent rise has to be due to CO2 because there are “no other known natural or astronomical cyclical causes.” This implies that you have knowledge of all the known natural or astronomical cycles. Somehow I doubt that…. “The research, published in a paper in the May 15  issue of Geophysical Research Letters, provides striking evidence that sunspots — blemishes on the sun’s surface indicating strong solar activity — do influence global climate change, but that explosive volcanic eruptions on Earth can completely reverse those influences. “By carefully studying the timing of other volcanic eruptions, we found that they coincided with all of the correlation reversals between sunspots and climate,” said Ram. ….The UB team discovered that these additional sulfates cause cosmic rays to have a more pronounced effect on Earth by spurring the formation of small droplets in the atmosphere that, in turn, cause the formation of a type of cloud that does not produce rain. Nope, we do know nearly exactly how much of the extra CO2 has come from natural versus anthropogenic sources, by measuring the isotopes, which have a distinct signature between natural and anthropogenic. As an AGW skeptic, this particular line of attact is not an argument you can successfully make. It is pretty much not in dispute that the 40% rise in atmospheric CO2 since the 1700’s has been caused by human activities…primarily the burning of fossil fuels, which give a very characteristic signature in the CO2 isotope. “Nope, we do know nearly exactly how much of the extra CO2 has come from natural versus anthropogenic sources, by measuring the isotopes, which have a distinct signature between natural and anthropogenic.” As an AGW skeptic, this particular line of attact is not an argument you can successfully make. It is pretty much not in dispute that the 40% rise in atmospheric CO2 since the 1700′s has been caused by human activities…primarily the burning of fossil fuels, which give a very characteristic signature in the CO2 isotope. It very much IS in dispute. And your use of “we” in your quote is hilarious, as if you are one of the “we’s”. You cannot say “we”, as you are not a researcher, nor are you a scientist. But thanks for the laugh. Warmists point to the inertia of the current warm period trend implying that ten years of no warming will not effect the 300 year warming trend since the LIA. Ice core temperature reconstructions especially those from recent high resolution reconstructions all demonstrate Holocene cooling over the last ten thousand years. If indeed there is radiative forcing from co2, good luck in changing the trend. After all we know within the next 2000 years we will fall of a cliff into the next ice age. Although orbital forcing is proposed as the main reason for the Holocene optimum I was surprised to read in one of Steig’s papers on Antarctica that He suggested a decline in solar insolation as the cause of Holocene cooling. Nothing Surprising. We just need to be relentless in our science and the nutcases will gradually fall away. Like a dysfunctional mutation, diseased thinking cannot survive long because it has no connection to reality. We will outlast ’em. It is good that Gudmund Lovö and Astrid Lyså, (NGU) came with their study about the the beaches in Northern Greenland, (82 degrees North). I worked in the 1960s and 70s in Vilhelmina, Lapland, Sweden . I visited than a few places, very well protected areas in steep southern slopes where old trees of the Ulmus species grew. One of the places is now a forest reserv Skikkisjoberget (about 65 degree N. and 16 30 East) above 600 metres over sea level. They are old relicts. They could be from the same period as the beaches . I have never heard that any research has been done. I believe that Ulmus species to day are growing in stands in Southern Sweden about 58 degrees North but not North of 60 degrees N.
Although orbital forcing is proposed as the main reason for the Holocene optimum I was surprised to read in one of Steig’s papers on Antarctica that He suggested a decline in solar insolation as the cause of Holocene cooling. Orbital forcing works by changing the distribution of insolation. You are full of sh**, R Gates. Mods, can we have some consistency regarding abusive posts please. bl57~mod would you please email me personally on this? You must be a new moderator, as I do not recognize your signature. That was not a name call, it was a blanked out expletive, which many times in the past we were able to use. To say someone is full of it….is not a name call….it is a figure of speech. I have given money to the surfacstations.org cause and been a loyal poster on here for a long time. Also I readily give out my name and email for folks to contact me personally if they like, if they have a problem. Ah, so here is the tattletale. I should have known. Phil, since you like to think that you are a quasi-moderator around here, why don’t you contact me personally at sharkhearted@gmail.com and I will be happy to speak with you. Feel free to contact me, Phil. I will be happy to discuss it with you. These have been allowed in the past and I guess I was going along with everyone else and pushing the envelope. But duly noted from now on. Calm down, friend. Gates drives me crazy with his writing style also. 2) Are there there other equally likely explanations to the 20th and 21st century warming, besides CO2? Solar, PDO, AMO? Now, related to the Holocene Optimum, where it appears quite likely that Arctic Sea Ice was at a reduced level, this does not appear to be a CO2 related event, and was more likely a Milankovitch cycle derived warming. It is absurd to argue that this proves that the current warming of the Arctic can’t be related to CO2 increases, as one cause (Milankovitch) does not in any way preclude another (CO2 induced). If I’d posted using that language I’d probably been banned for 24hrs ( I was recently for using much less offensive language), I just asked for consistency. It was ad hominem by the way, attacking the man rather than the argument. Oh it very much IS in dispute, R Gates. I will let you tussle with the likes of Roy Spencer and others…and then we’ll see who wins the debate in the end. As I have said many many times. Would love to actually see you in a debate with these giants. The outcome would be predicted faster than any ensemble of models could ever turn out the single strand of spaghetti that would result, no doubt.